The countertop you choose has a big impact on your kitchen's appearance and functionality. Let our handy guide help you pick the right countertop material for your needs. Kitchen makeovers are among the most popular of home improvements. They can be costly—a mid-range minor kitchen remodel that includes new countertops, appliances, cabinet fronts, and hardware runs close to $20,000, according to Remodeling magazine’s 2011-2012 Cost vs. Value Report. But the expense has a payoff—upon resale, kitchen renovations can reap a return on investment upwards of 50 percent. With so much at stake, it’s important to choose materials wisely. This is particularly true of the countertop, one of the most prominent features in any kitchen. There are a dizzying array of materials to consider; each material has its own features and benefits, as well as drawbacks and maintenance requirements. Use our kitchen countertop guide to help you find the material that best suits your home’s needs—and gets you one step further down the road to a successful renovation. SOLID SURFACE countertops are designed to withstand years of wear. They resist stains, moisture, sunlight, and heat, and come in a full range of colors to complement any kitchen design. Solid surface countertops can be made with an integrated sink. Fine scratches or stains can be buffed out of solid surface countertops with a mild abrasive. Although a plastic-like patina may develop on the surface over time, this can easily be removed by a professional. MARBLE appeals to serious cooks because it is durable and scorch resistant. Naturally porous, the material is susceptible to etching. Chemical corrosion can be buffed out with marble polish. Oil stains can be removed with ammonia, hydrogen peroxide, or mineral spirits, and food stains can be lifted with a water-based paste of baking soda and dish soap. 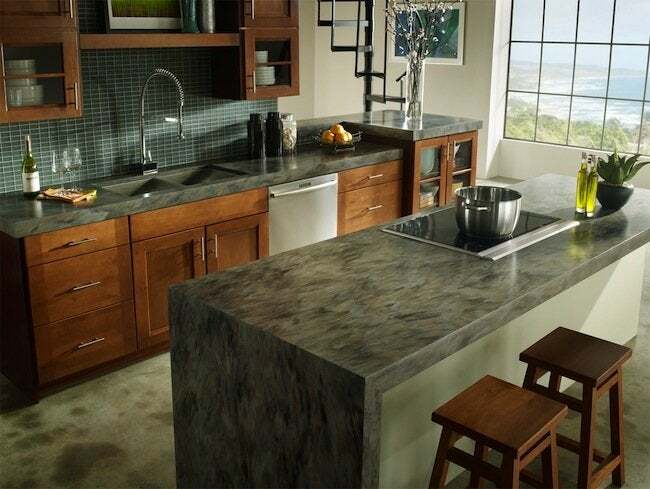 GRANITE offers natural beauty and near diamond-hard durability, making it an ideal material for countertops. It resists heat, scratches, and stains—and most granites require no sealing. Because it is nonporous, granite also protects against mold and mildew. HARDWOODS like maple, mahogany, and cherry, as well as current popular choices like madrone, add warmth to any kitchen and can be refinished numerous times, aging beautifully. For long-lasting butcher block wood countertops, apply mineral oil monthly. 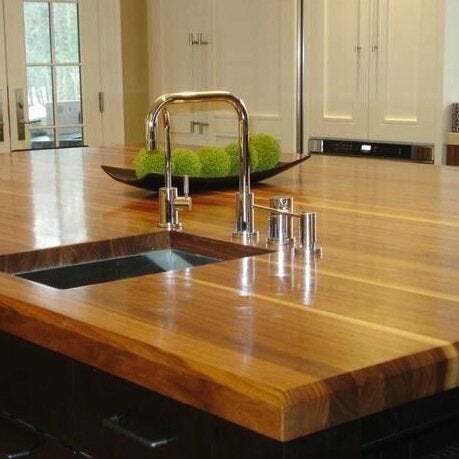 Non-butcher block wood countertops do best with marine oil, which keeps the stain from fading. Marks and burns can be sanded out of wood, and stains are easily removable with lemon juice or hydrogen peroxide. SOAPSTONE is extremely durable and impervious to virtually all chemicals. Because it is nonporous and does not react to chemicals or temperature variations, it is resistant to staining and scorching, and does not require sealing. It can be left to age naturally or sealed for a darker, richer look. Nicks and scratches are common, adding to the countertop’s rugged patina. Slight discoloration from contact with oil can be rubbed out with mineral oil. QUARTZ SURFACING countertops are made of crushed natural quartz blended with color pigments and plastic resins. The nonporous material offers hygienic antibacterial benefits and does not need to be sealed. Quartz countertops are heat, stain, and scratch resistant. If stains do occur, a paste of hydrogen peroxide and flour, applied and left to sit for 24 hours, will lift a spot right out. CONCRETE is a favorite of those who want an industrial look. It is extremely versatile and can take on many different colors, shadings, patterns, and sheens. Concrete countertops can be poured in place or fabricated off-site and installed later. Dedicated DIYers can construct their own fairly easily, as well. Concrete countertops should be specially sealed to avoid staining. Applying tung oil a few times a year can keep them stain resistant, and wax can be applied for a glossier look. TILE is favored for its durability and affordability. It comes in various colors, sizes, and textures, and can be made of porcelain, ceramic, or stone. Tiling is an attainable DIY project—just be sure to seal the grout used between the tiles to ward off bacteria. STAINLESS STEEL countertops are particularly well suited to the areas around cooktops and ranges where hot pots and pans are placed, or center islands where food prep and serving are the main focus. Scratches are inevitable with a stainless steel surface, but they can be buffed out with an abrasive pad. Prevent rusting by keeping cast iron pans away from the counter. Any rust stains that do occur may be eliminated with a paste of lemon juice and baking soda. LAMINATE provides a budget-friendly countertop with a retro look. The material is fairly durable but not heat resistant. Installation is relatively quick, which helps to keep costs down. A simple paste of baking soda and water left on a laminate surface for three to five minutes will remove most stains, while difficult stains may be fought using household bleach rubbed in gently with a cotton ball.